Wu Qin Xi (五禽戏) – The Five Animal Frolics can be regarded as the earliest form of Medical Qigong in Chinese history, dating back to Eastern Han Dynasty (25-220). 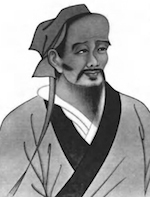 The creation of Wu Qin Xi was attributed the famous Chinese Physician and Surgeon Hua Tuo (110-207) who had great skills as a surgeon, acupuncturist, herbalist and knowledge of human anatomy. He is also believed to be the first person in the world to have developed the use of anaesthesia. Besides treating his patients when they were ill, Hua Tuo was also keen to recommend physical exercises for people as a method of rehabilitation, recovery, and most importantly for prevention. Wu Qin Xi is a set of Daoyin (deep stretching) and Tu Na (deep breathing) exercise imitates the actions of animals based on the habits of the tiger, deer, bear, monkey and bird. Although the profile and value of Wu Qin Xi remained high through the history of China and Chinese population around the world, the lack of illustrated documents that survived the turbulence changes of China and indeed the world, means that many different version of Wu Qin Xi is inevitable. Health Qigong Wu Qin Xi, one of Health Qigong series, is a new development with the support of Chinese Health Qigong Association to embody the essence of the traditional Wu Qin Xi with balanced physical approach and bring good health and well being for people living in the 21st century. It presents the scientific concept and the character of the modern time sufficiently, and accords with the traditional principles of regulating the body, breath and mind in Qigong. As a result, it fits the needs of people to promote their health. Tiger is the ruler of the deep wild mountains of China. It represents strength and courage in traditional Chinese martial arts and the spirit of Tiger has always provided a deeply profound source of inspiration on Chinese folklore and theatrical production. The Tiger Play consists of two routines: Raise the Tiger’s Claws & Seizing the Prey. Stand at ease with arms hanging loosely, feet together forward. Settle the mind into a calm, peaceful state of concentration. Continuing on, develop the claws into two fists and raise the fists slowly upwards to the front of the shoulders (pics 2-3). Unclench the fists and raise the palms upwards as far as possible then form the claws again. Eyes follow the movement of the hands (pics 4 & 5). Clench the fists again with eyes watching the change (pic 5). Repeat 1-5 three times. Inhale as you raise the fists/palms upwards and exhale when you lower the fists/palms downwards. Focus the mind on the heel of the palms when pushing upwards to the top and pressing downwards with palms. Imagine your movements are meeting against resistance and the extension of the body is connected through each section of the spine, the waist, the hips, and legs all the way to the bottom of the feet. The body sprung forward as if the tiger leaps forward, with both arms extend straight out and palms forming tigers claw at the same time. The waist should be straight without hunching as this will allow the deep stretch to complete from the claws through to tail bone in one straight line. Eyes looking straight ahead (see pic 9). Continuing on, similar to the way cats flexing its back, flexing the body from the knees, hips, and abdomen then to mid back and upper back while scratching back and downward the claws towards the side of the knees, eyes look slightly downwards (pic 10). Continue to flex the back, then extend the knee, and move hips, abdomen forward and the upper body inclines backwards. At the same time hands form hollow fists and raise along side of the body to the chest level (pic 11). Eyes look ahead. Step back to parallel stance and hands form hollow fists, return to reparatory position (pic 14). 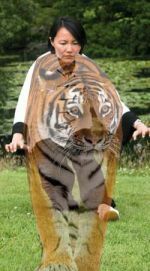 Repeat Tiger Seizes its Prey at least once on each side, and increase the repetition wherever possible in your practice, to strengthen the leg muscle, abdominal strength and the lower back. Inhale on movement 1 and 3/4 and exhale on movement 2 and 5/6. The complete flexing movement of the body with squatting with the knees, contacting the abdomen and chest then extending the knees, thrusting the hip forward and abdomen and backwards inclination of the body should be done smoothly and continually like a wave. The downward seizing of its prey should be done gently first, but gradually more vigorously with faster and deeper inhalation from Dantian, embracing the fierce and brave spirit of the Tiger. The deep stretching on the arms will help loosening up the shoulders, lifting up the rib cage and benefit movement of the lungs. The bending and extending movements can greatly improve the flexibility of the spine, getting rid of muscle stiffness along the spinal column and maintaining healthy function of the torso. Wise practitioners should also be aware that beyond all physical extension and contraction of the movements, it is internal impact of these movements that bring the healing benefit for the long term. In particular, the bending and flexing movement on the Spinal Column will help to activate the meridians along the Dumai (governing channel) which extends along the posterior midline and Renmai (conception channel) which extends along the anterior midline, keep the blockage free, ensure the smooth flow of Qi and blood and promote the balance of Yin and Yang in our body.